Prime Time Sports Talk | Which Rental Should be on the Red Sox’ Radar? Which Rental Should be on the Red Sox’ Radar? The Red Sox need to shake things up, having sputtered offensively since May 25, averaging less than 4.5 runs per game in that stretch. The general consensus in Red Sox Nation is that trading Rafael Devers in a potential deal for Baltimore Orioles superstar, Manny Machado, would ultimately turn into a failure for Dave Dombrowski. This is due to the fact that Devers still has five years left on his deal before free agency, and Manny Machado is a young star who will likely not be returning to Boston next season; and if he does, it’ll be for somewhere north of $300 million. However, even though Devers is hitting .313, with three homers in his last 12 games, he’s still hitting just .243 on the year. Also, to be frank, with baseball being a game of streaks, there’s no real guarantee that he will be playing at this level offensively for the remainder of the season. But if the Red Sox were to trade Rafael Devers for a rental player, who would it be? The answer is simple: Bryce Harper. Harper is hitting a career-low .213 this season, but still leads the National League with 19 home runs and 52 walks on the year. The 25-year-old is set to enter free agency for the first time in his career, and his agency set the bar insanely high for teams looking to potentially sign the young phenom. But with the way he is playing, $400-$500 million seems incredibly far-fetched at this point. On top of Harper’s bad two month stretch of baseball, the Nationals have gotten a spark offensively from 19-year-old, Juan Soto, who’s slashing .326/.420/.593 with six home runs and 14 RBI in 26 games. With the likes of Adam Eaton and Michael A. Taylor already having cemented their place on the Nationals ballclub, Juan Soto seems to be the likely replacement for Bryce Harper. 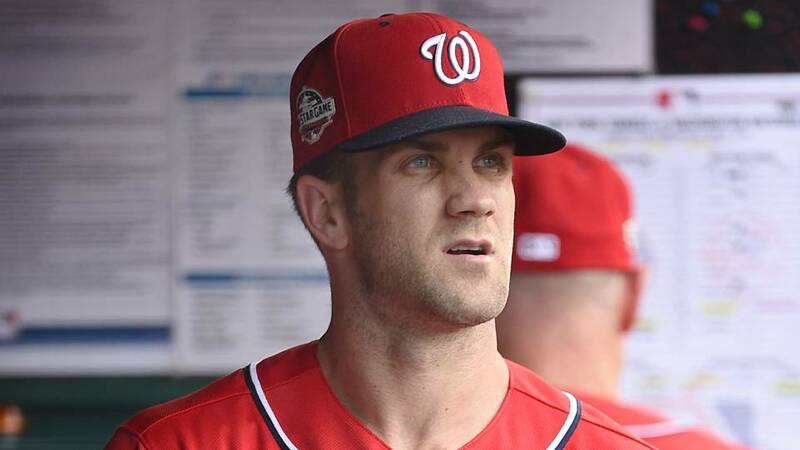 Combine that with the fact Harper isn’t playing very well, the Nationals may find it in their best interest to move Harper, and make sure they can at least get something in return for him before he ultimately walks. Which is where the Sox come into play. In need of an offensive spark, Bryce Harper makes perfect sense. On top of that, Harper is in need of a new approach at the plate. “He’s getting too anxious… he needs to get back to hitting the ball the other way,” said MLB Network’s Tom Verducci. Which is exactly right, and we’ve seen the Green Monster become a lot of people’s best friends over the years. Look at David Ortiz for example, he came to the Red Sox as a dead-pull hitter. After a season with the Red Sox, Ortiz turned into a hall of fame caliber player. Yes, he pulled a lot of majestic home runs, but his ability to pepper that Monster in left made him a complete hitter, not just some guy with pop. Harper could really fix his own market for this offseason with just a half season in Boston, and playing here also would give the Red Sox a bit of leverage in the free agent market when it comes to potentially retaining him. It’s a longshot, as it seems highly unlikely that the Nationals would move Harper, but time will tell. It’ll make for an interesting headline if Juan Soto plays Bryce Harper out of town.